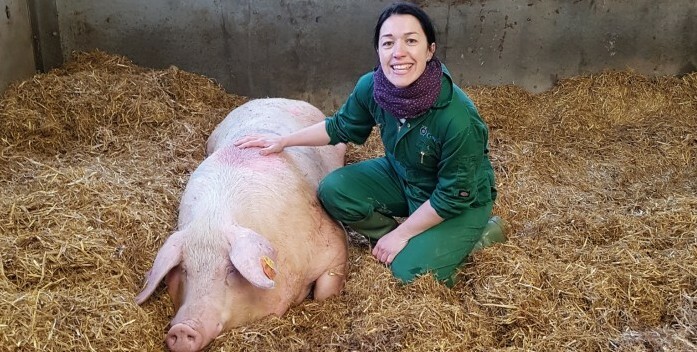 Ciara O’Neill is a veterinary surgeon with the Garth Pig Practice. Based in the South West, she has a keen interest in gilt management. A colleague recently described to me a sign on a farrowing room door – it read: ‘Dip your boots before entry’. Underneath it, someone had added the damning: ‘This means you too, Mr Owner’. It’s a good reminder that internal biosecurity is the responsibility of everyone. To everyone, it should mean the process of identifying the pathogens already present on the unit and reducing their ability to affect the pigs’ health by reducing pathogen load, limiting pathogen spread and maximising the pigs’ ability to mount an immune response to them when exposed. Many internal biosecurity procedures have evolved – some from trial and error and some from careful consideration of prevailing winds, staff movements, disease risk etc. But all biosecurity measures should be consistently reviewed and updated. Perhaps one element to include in your ‘spring clean’ biosecurity review is a calculation of value per pig per disease agent prevented by any new internal biosecurity intervention or procedure. This calculation, alongside a risk assessment per pathogen, can be used to create a ‘must-do’ list. For example, post-weaning E.coli diarrhoea is often prevalent within herds due to a combination of factors around weaning – stress, change in diet, incomplete cleaning and disinfection, mixing of pigs and movement of people and equipment. With the cost of E.coli PWD being up to £3.50 per pig, a long-term investment in E.coli reduction measures such as separate weaner equipment, barrier entry to the weaner house, and a vaccination programme would pay off. communicated to staff – otherwise, when everyone is under the pump, any biosecurity measure that appears to have little risk but some inconvenience attached will be forgotten. All-in, all-out systems only work if they are 100% ‘all-in, all out’. Any degree of compromise undermines the whole process. We think of people on farms as being one of the greatest risks to biosecurity, usually because of their ability to transport pathogens on their clothes, on their hands, on their feed and out of their lungs, but often fail to remember that human behaviour, and in particular, constant vigilance and attention to detail, will have the greatest impact on internal biosecurity on our farms.